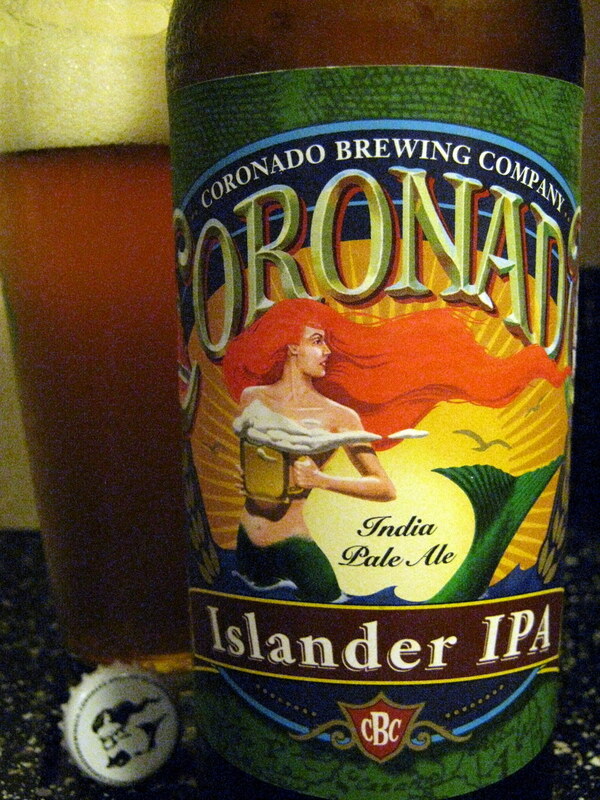 It’s been a while since I’ve had Islander IPA from Coronado Brewing Company. For some reason I’ve been drawn to their Idiot IPA lately, passing it by. In my head Islander IPA became the “little brother” to the bigger, higher ABV Idiot IPA. And while it’s true that at 8.5% ABV Idiot IPA is bigger, Islander IPA is no slouch itself at 7% ABV. It’s not all about the alcohol content, but for some strange reason I just kept passing Islander IPA up. Well thankfully I’m revisiting it here and won’t be passing it up any longer. Islander IPA is big and hoppy with plenty of fruitiness to it. There’s plenty of hop flavor but a lot more hop bitterness than I expected. The first sip is pine-like hops before the grainy, somewhat sweet malts appear. It’s not too sweet, but what little there is helps keep the bitterness in balance, but the graininess here gets in the way. Some tropical fruit flavors follow, with quite a bit of hop bitterness in the finish. It finishes a bit on the sweet side, but overly sweet. At $4 for a 22oz bottle and available in 6-packs of 12oz bottles as well, Islander IPA is quite a deal. As with all IPA’s make sure to get it fresh, Coronado stamps the bottled date on their labels, it’s a little hard to read, but it looks like this one was bottled exactly 2 months ago on June 29th. Look for Idiot IPA to show up here on San Diego Brewed sometime in the future. Just not too soon, I’ll be enjoying Islander for a while. And even though Coronado isn’t technically an island, I’ll forgive Coronado Brewing Company for the name. Islander IPA sounds a heck of a lot better than Peninsular IPA. Three flights will be available for purchase Thursday evening, all selected to highlight interesting and exciting aspects of craft beer, both locally and globally. As always individual beers will be available for purchase as well from the large selection stocked by Bottlecraft. * Flights are subject to change in the unlikely occasion that any of the beers don’t show up in time for the show. But we’ll make sure they get substituted with something equally awesome and in line with the theme of the flight. It’s been a few weeks since the last Farmhouse Friday, but it’s back this week with an awesome Saison (that comes in a can!) that unfortunately isn’t available in San Diego. But if you find yourself in the Midwest where Surly is available make sure to pick some up. 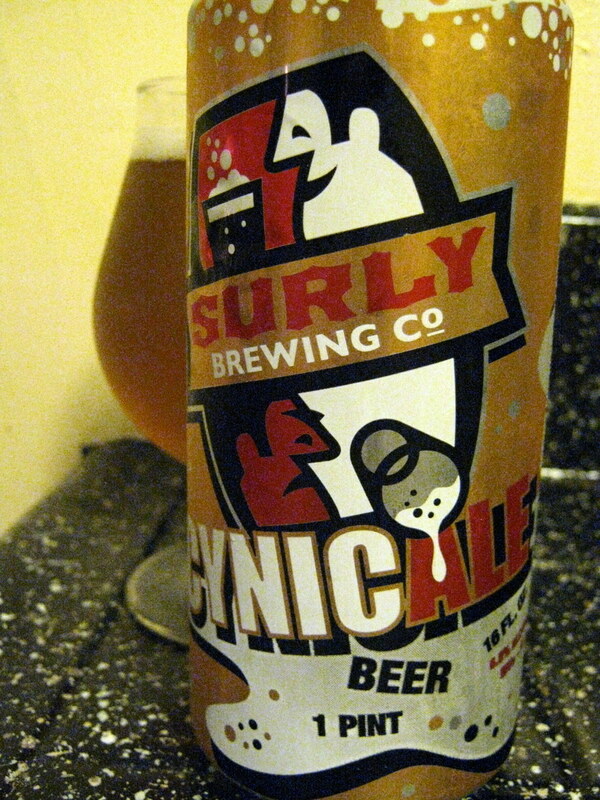 I got this 16oz can of Surly CynicAle as an extra in a beer trade a few weeks back. I’m a big fan craft beer in cans, but I’ve been a bit cynical (pun definitely intended) about larger format cans. In the past I just didn’t see the point in a bigger can, more beer to get warm as you drink the first 12oz I thought. But I have to say, when I finished the 12 or so ounces in the glass that I originally poured it in I was ecstatic to find that I still had a bit left in the can, mind you it wasn’t a whole lot, but a decent amount. I would have hesitated to open a second 12oz can, but those extra few ounces in the 16oz can were pretty nice. So I say bring on the 16oz cans. Or the 12oz cans. Just put more craft beer in cans! Now, on to the actual beer. 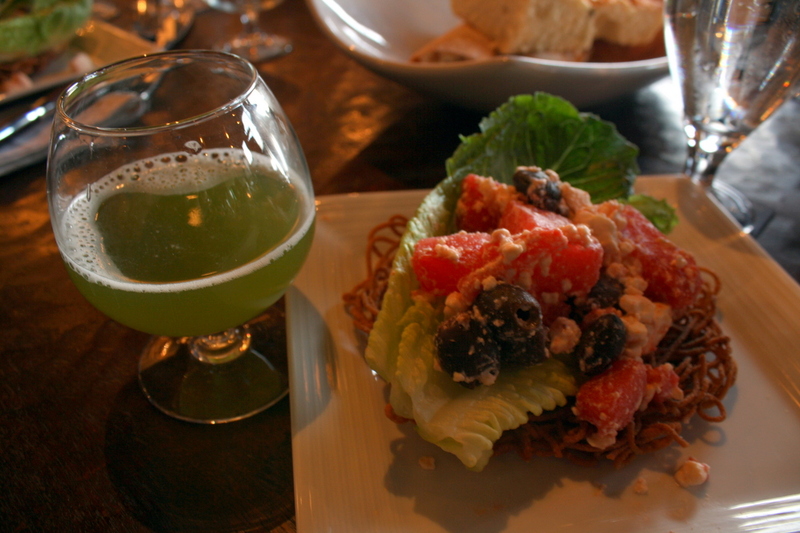 CynicAle is more or less what you’d expect from a Saison of the modern style. It’s fairly light, well carbonated, and the flavor is pretty yeast driven. Surly doesn’t take too many liberties, adding all sorts of adjuncts and stretching the definition of Saison (which don’t get me wrong, is perfectly acceptable in my opinion). CynicAle might be a touch sweeter than one would expect there’s a subdued but definitely present honey and stone fruit like sweetness upon first sip. The flavor gets a bit floral (the smell could be described as a bit grassy, but not the taste) before a nice wave of spicy black pepper takes over. The finish is pretty dry with a long lingering spicyness sticking around until the next sip when everything starts all over again. I was really impressed with CynicAle. Bonus points could be given for being in a can, but regardless of the container the beer proves itself on it’s own merits. You can’t walk down to the local bottle shop to pick this one up, but as I said, if you find yourself in the Midwest keep an eye out for it. 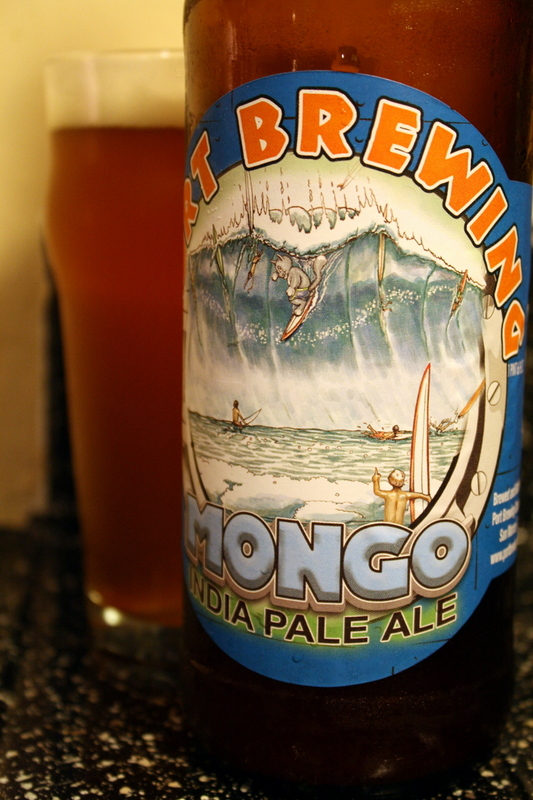 San Diego Brewed: Mongo from Port Brewing Co. 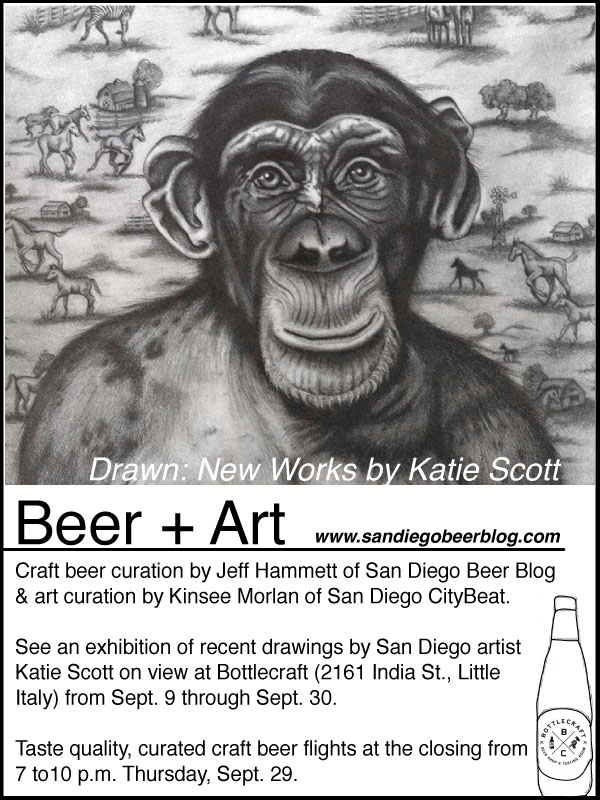 Welcome to San Diego Brewed, a new weekly feature here at San Diego Beer Blog. Each week I’ll highlight a different beer brewed at a local San Diego County brewery. Big thanks to Bottlecraft for sponsoring this series. It’s been less than two years since Port Brewing Company first introduced Mongo, their Double IPA brewed as a tribute to a brewery kitten that as they say on their website, “used each of his 9 lives in a short – but brazen – 10 months on this planet.” In that short time the beer has proven itself worthy DIPA in a beer market overflowing with plenty of hoppy beers to choose from. Mongo was draft only for about the first year it was brewed, but Port Brewing started bottling it in 22oz bottles earlier this year. Mongo is a big beer, 8.5% ABV and brewed with plenty of hops, Columbus, Amarillo, Centennial, Cascade and Simcoe to be exact. It’s the use of those hops that impress me so much. Mongo isn’t the most bitter DIPA around (although there’s plenty of hop bitterness, don’t you worry), it has a great balance between hop bitterness and hop flavor. There’s plenty of juicy citrus with maybe just a bit of pine like hop flavor coming through in the taste. The malts most definitely take a back seat to the hops here and I certainly wouldn’t call it a balanced beer (but I don’t consider that a bad thing in a beer like this). Port Brewing Co.’s Mongo should be pretty easy to find around town in 22oz bottles (around $6 per bottle) and on draft. The bottles have a yellow ‘bottled-on’ date on the neck, as with any hop-forward beer double check to make sure it’s not too old before buying, the more recently bottled the better. One word of warning, there was a bit of sediment in the bottom of the bottle I had (this is normal in bottle conditioned beers) so pour carefully if you’d like to avoid it ending up in your glass. Fun fact: Mongo was the kitten’s nickname. His actual name was Columbus and his parents were Amarillo and Cascade. 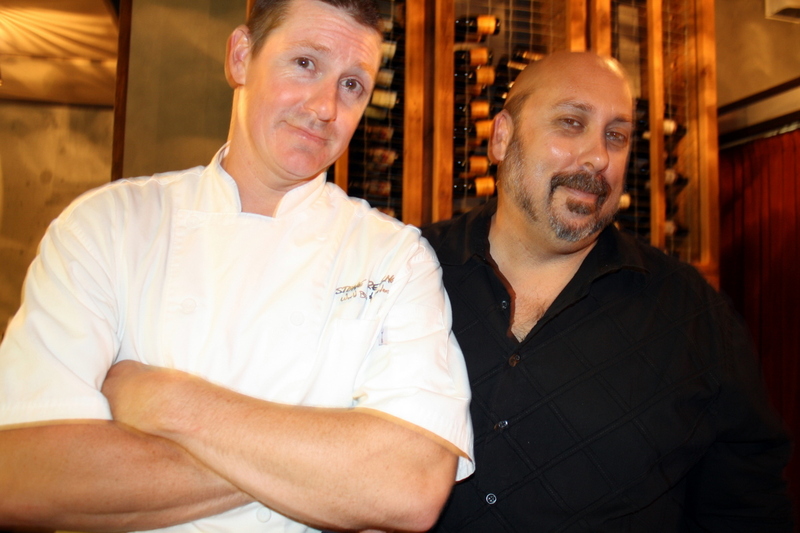 Posted by Jeff Hammett in 5 points brewing co., bars and restaurants, beer previews, breweries, coronado brewing co., green flash brewing co., monkey paw, new english brewing co., stone brewing co. Here are a few bits of news that I didn’t feel were worthy of full posts by themselves, but are noteworthy none the less. Chuck [Silva] came up with a new method to make a Double IPA by performing a double brew to make a single beer. First there is a single infusion mash and subsequent boil at 65 IBU with Columbus and Centennial hops. Then a second duplicate mash using the 65 IBU wort instead of water and a second 65 IBU boil using the same hop schedule. The result is a higher gravity beer with kettle caramelizing in place of crystal malts and an elevated hop flavor and bitterness that might not be achieved with the same amount of ingredients in a single brew. Hop Heads, this beer is for you! 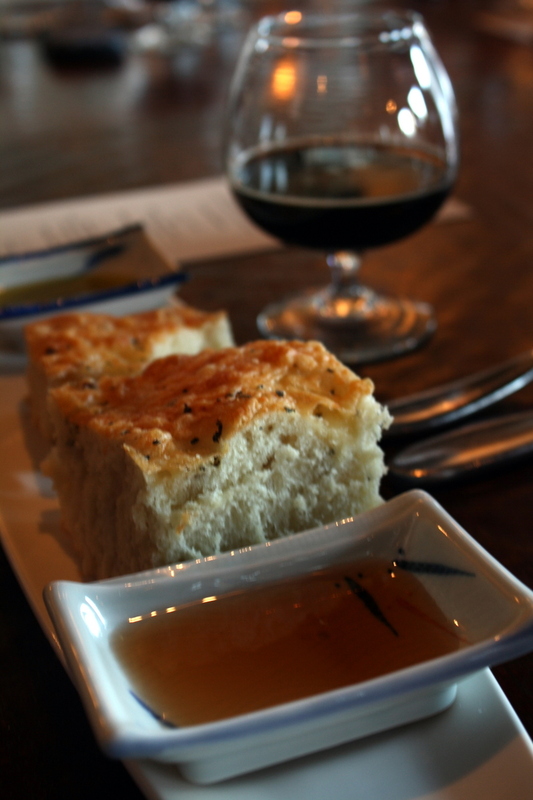 New English Brewing Company recently received a brewing license for a new location in Sorrento Valley. According to New English owner Simon Lacey they will have a 3.5 barrel brewhouse at the new facility which will focus on specialty beer development and cask beer production as well as house a tasting room. New English currently brews at the Old Mission Brewery building in Middletown which is where their standard beer production will remain when the new facility opens up. No word on when the new facility located at 11545 Sorrento Valley Rd, Suites 305 & 306 will open. Speaking of the Old Mission Brewery building, Coronado Brewing Company which has supplemented their brewing capacity at their brewpub in Coronado by contract brewing with 5 Points Brewing Co. at the Old Mission Brewery building today announced they will be opening a new facility with a 30 barrel brewhouse and 60 barrel fermenters, tasting room and retail shop at 1205 Knoxville St in the Tecolote Canyon area. 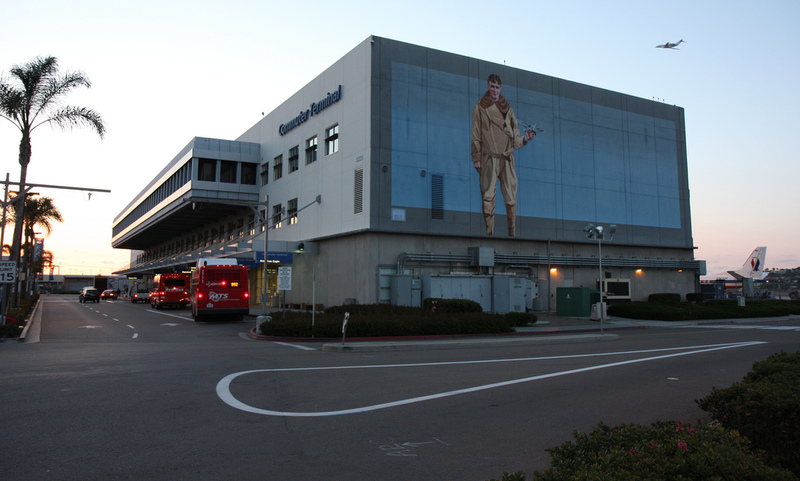 Coronado expects to have the new facility open by Spring of 2012. I was talking with some folks from Coronado Brewing Company a few weeks ago and they expect that they will cease production at 5 Points Brewing Co. once their new facility comes online. According to CBC President Rick Chapman the Coronado brewpub will focus on specialty beers and one-offs once the new facility opens. In a news release sent out today Chapman noted that CBC sales were up 64% in San Diego alone last year. Tin Can Alehouse, which while they do have an impressive amount of beer available in cans is more of a live music venue than a beer focused bar has applied for a transfer of their liquor license from their current location in Banker’s Hill to a new spot in downtown’s East Village neighborhood. An email sent to Tin Can Alehouse was not returned, but the license for the new spot at 701 16th Street is currently pending review with the ABC. One thing I noticed was that the new license lists the business as “Tin Can Live Music,” so maybe they will be dropping the “Alehouse” moniker all together. Update: Here is Tin Can’s new liquor license application. Update 2: While the status on the application still shows as “Pending”, I’ve heard that Tin Can withdrew the application and will not be moving to 701 16th St. In other East Village news I hear that Monkey Paw, the new brewpub from Scot Blair is coming along nicely and should be opening real soon. No word on an exact date but I’ve been told the bar and restaurant portion could be open before the end of the month if things go smoothly. I’m also told the brewhouse is shaping up as well, but is a bit farther out. Expect updates on both the bar opening and brewing beginning as soon as I know more. Last, but certainly not least, Stone Brewing Co. today released their Stone 15th Anniversary Escondidian Imperial Black IPA. I haven’t tried it yet, but was certainly impressed with the Stone SoCal Hop Salute Double Black IPA given to NHC attendees in June. While not the same recipe, the two beers are of the same style, it will be interesting to see how they differ. Update 9/23/2011: Holiday Wine Cellar posted on their Facebook page that bottles are now available at HWC. I’ve heard rumors bottles may be available at Ballast Point in the future, but have not confirmed that. Update 9/1/2011: According to Holiday Wine Cellar’s Labor Day newsletter bottles should be released in early October. I wrote about Ballast Point’s Indra Kunindra India-Style Export Stout, a stout brewed with curry spices, coconut, kaffir lime, cayenne and cumin, a couple months ago when it was first on draft in their tasting room. Indra Kunindra, the winner of Holiday Wine Cellar’s 2nd Annual Homebrew competition last year, seemed to have an uncertain future at the time, the folks at Ballast Point told me they weren’t sure if it would ever get bottled or not. 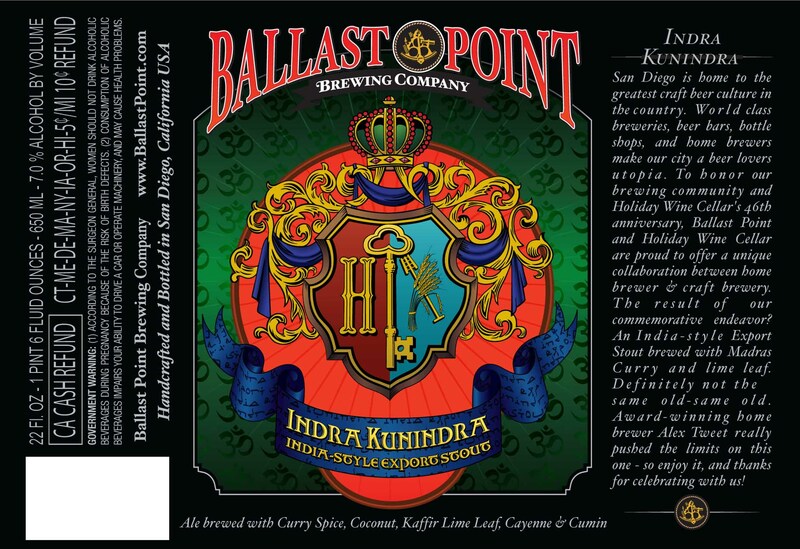 This week Ballast Point got label approval for 22oz bottles of Indra Kunindra, which doesn’t mean they’re guaranteed to bottle it, but chances are pretty good the beer will make it into bottles at this point. Judging by the number of pageviews my previous post on Indra Kunindra received, there seems to be high demand for this beer. Putting it in bottles should help more people try it that can’t make it to one of Ballast Point’s locations. 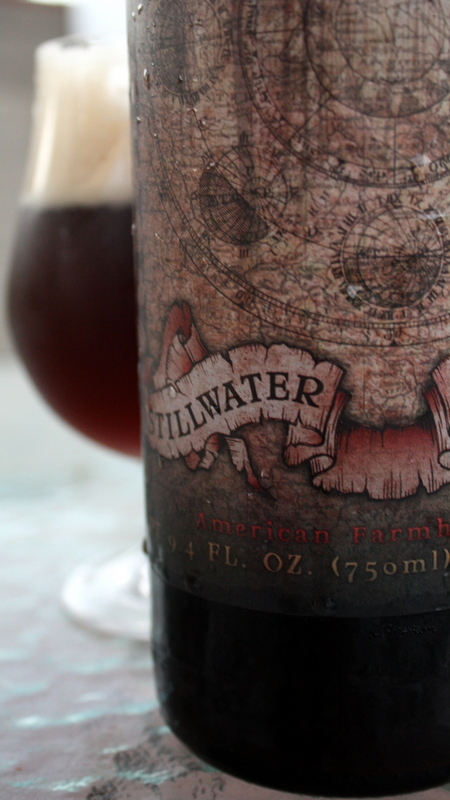 Based on the name, I’ve always assumed that Stillwater Artisanal Ales’ Autumnal was a Fall seasonal. I’m not sure if that is the case, but I think this bottle might be older, maybe even as old as last fall. I couldn’t find a bottled on or a best by date on the bottle, I picked this 750ml bottle up at Best Damn Beer Shop a few weeks ago for $11.99 and not long after they put it on special for $8.99, I’m assuming that was to move out older inventory. Regardless of the age, this is still a fantastic beer. If it is older I’m sure some of the hops have dropped off, but I have no complaints. Autumnal is 7.2% ABV and the label lists it as an “American Farmhouse Ale” with German inspiration and a nod to Belgian tradition. It’s darker than most Saisons, a reddish brown. The bottle foamed up a bit when I opened the cap, but it didn’t gush out, no beer was lost. It smells sweet and earthy. The first taste is sweet, caramel and sort of fruity, plums come to mind. It also has an earthy characteristic, often described as rustic. The finish is dry — I feel like I write this ever week for Farmhouse Friday, but it really is one of the major characteristics that every Saison strives for. It’s also a bit spicy at the end and in the aftertaste. All around a good beer, if it is indeed push a year old I’d love to taste a fresh bottle to see if the hops play a bigger role when it’s fresh. Brian Strumke, Stillwater’s brewer, will be at Stone Brewing World Bistro and Gardens next Thursday, August 11th for a Meet the Brewer event and a Brewmasters Series dinner along with Jeppe Jarnit-Bjergsø of Evil Twin. Click here for more info on both events including the beers that will be available that night. I got a head start on #IPADay by sampling a few of the Mikkeller Single Hop IPAs earlier this week. Mikkeller brewed nearly 20 IPAs, all with the exact same recipe using only a single hop variety, with the only difference between each beer being the use of a different hop. With everything being equal except for the hops this allows for a better chance at evaluating the differences between the different hop varietals. 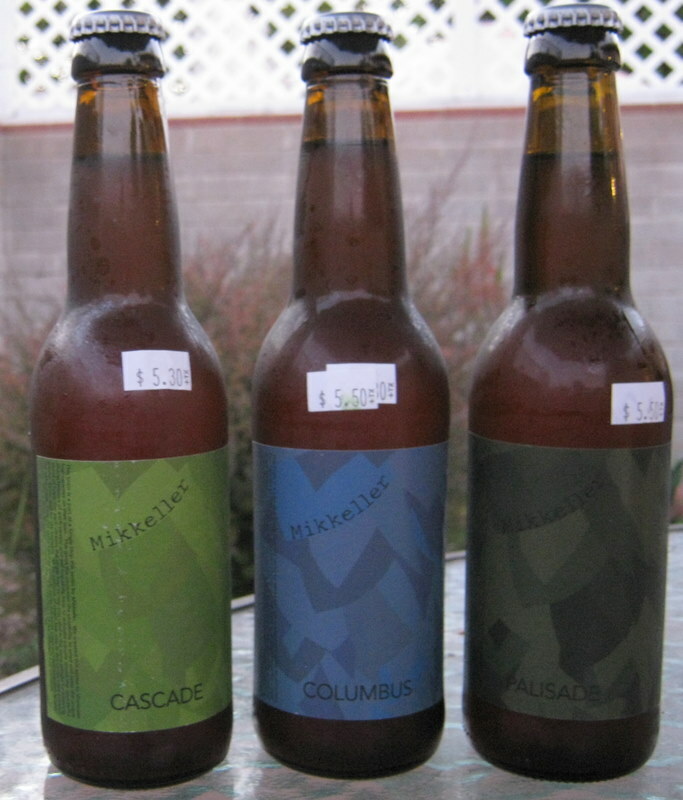 I picked up the Cascade, Palisade and Columbus offerings and drank them all side by side for comparisons sake. Each one of them is 6.8% and looked more or less the same (same color and head retention). To better let the hop smells and flavors come out I left them all warm up to about 6oF. I found each one of them fairly sweet, with quite a bit of caramel flavors which seemed to detract from the hops being front and center. Due to the different hops each beer had a different IBU with the Cascade coming in the lowest at 38 IBU. Out of the three hops used here, Cascade might be the one I am most familiar with, thanks to the use of it in Sierra Nevada’s Pale Ale. It smelled and tasted very floral. The first sip was almost like eating a flower in a salad. It’s not overly bitter but the bitterness does linger. There’s some grapefruit smells and tastes in there as well. The Palisade IPA came in at 47 IBU, but it actually tasted less bitter than the Cascade version. It was sweeter and a little fruity. I later read that Palisade hops sometimes have an apricot like taste, which I never would have come up with on my own but certainly fit the taste. I didn’t taste any citrus, which is a common flavor in many hops. The Columbus IPA was the heavy hitter in the trio with a whopping 114 IBUs. It was bitter, more bitter than the previous two but it certainly didn’t seem over twice as bitter as the Palisade IPA or three times as bitter as the Cascade version. It smelled much more like a “typical” west coast IPA, but also had a bit of a chemical smell. 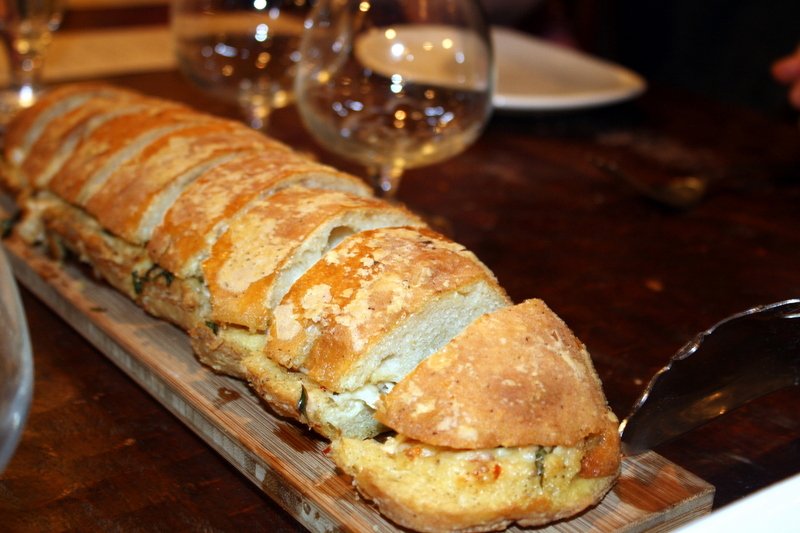 It had flavors reminiscent of pine and citrus as well as being a bit spicy. None of these three blew me away as beers. I don’t think I would drink any of them on their own, but it was great to drink them side by side, and the 6oz of each was perfect (I split each bottle with my brother). It certainly did highlight the differences with each hop, with each of these smelling and tasting very different. It also highlighted how important a good recipe is, just dumping a bunch of hops in a beer won’t lead to a good IPA, brewers must use the right combination of hops, in the right amounts to come up with a truly great IPA. Bottlecraft will be doing a flight of these three, plus the Single Hop Magnum version tomorrow in honor of #IPADay. The flight of four will cost $11. I picked these three up at Bottlecraft, the Cascade was $5.30 and the Palisade and Columbus were $5.50 each, all in 11.2oz bottles.